The leader of the Catholic Church and sovereign of the Vatican City State Pope Francis confesses to taking “Joy” from the performances of FC Barcelona forward but believes high applause is wrongly bestowed but is eager to point out that the Barcelona talisman “is not God”. Many believe the mercurial South American to be a deity, with his achievement increasing present expectations of individual greatness. He is loved and worshipped as a hero by millions around the globe and has seen his record-breaking on-field performances lead to him being showered with applause and real distinctions – both with his team and individually. “You can’t say it and I don’t believe it. I think people say ‘he is God’ just as they say ‘I adore you’. You have to adore only God. “It’s expressions that people use. This is a god with the ball on the pitch. It’s a popular way that people have of expressing themselves. 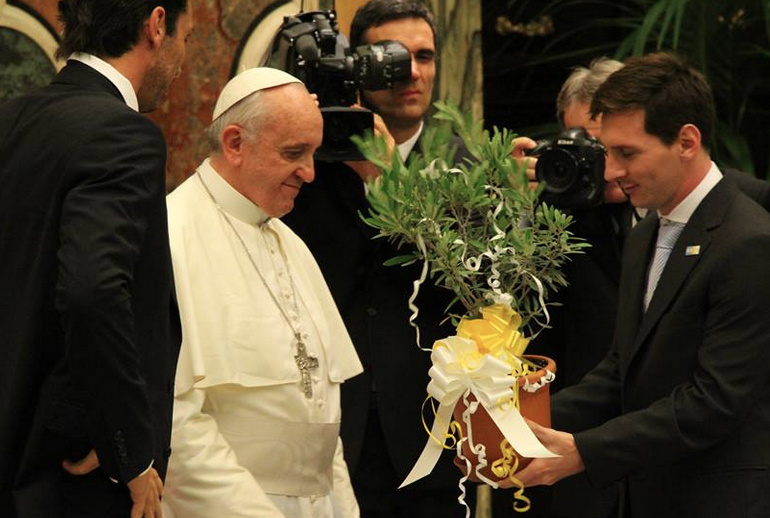 Pope Francis is known to be a football fan, he is a member at Argentinian side San Lorenzo, having been born and brought up in Buenos Aires, and has blended with stars of the sporting scene before. Barcelona’s forward told correspondents the occasion was “short but beautiful“.